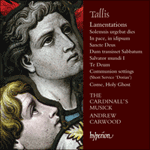 Tallis was one of the first composers to get to grips with writing liturgical music in English. We cannot know if Tallis was commissioned to write his Short Service (also called his ‘First’ or ‘Dorian’ Service) by a particular person or institution, but once Archbishop Cranmer’s first Prayer Book of 1549 was enacted then the die was cast. Services were now in English and there were clear injunctions about the type of music that should be used. Tallis is true to Cranmer’s instruction that there should be only one note for each syllable, setting the text with hardly any repetition and no use of melisma. Somewhere along the line there seems also to have been a direction or intimation that the high treble part, so much a feature of the previous generation and clearly heard in Tallis’ earlier works (such as Ave, Dei patris filia) was no longer required or appropriate. Tallis’ setting has a very restricted range (using only two and half octaves) and is scored for just four voices—a low treble or alto voice, tenor, baritone and bass. The whole ‘Dorian’ Service is found in John Barnard’s First Booke of Selected Church Musick (1641), and it was reprinted in Boyce’s Cathedral Music of 1760: there are no earlier sources. Tallis est l’un des premiers compositeurs à s’être attaqué de front à l’écriture de musique liturgique en anglais. On ignore s’il reçut d’une personne spécifique ou d’une institution la commande de son Short Service («Office court», également appelé «Premier» Office ou Office «dorien»), mais une fois promulgué, le premier Prayer Book de l’Archevêque Cranmer (rituel de l’Église anglicane; 1549), le sort en fut jeté. Les offices étaient désormais en anglais et il y eut des injonctions précises quant au type de musique qui devait être utilisé (une note par syllabe); Tallis respecte ces recommandations avec à peine une répétition du texte et aucun usage du mélisme. À un certain moment, une autre instruction ou suggestion semble avoir notifié que la partie de treble supérieur, si caractéristique de la génération précédente et très présente dans les œuvres antérieures de Tallis (comme Ave, Dei patris filia), n’était plus requise ni appropriée. La musique de Tallis a une étendue très limitée (deux octaves et demie seulement) et n’est écrite qu’à quatre voix—treble inférieur ou voix d’alto, ténor, baryton et basse. On trouve tout l’Office «dorien» dans le First Booke of Selected Church Musick (1641) de John Barnard, et il fut réimprimé dans Cathedral Music de Boyce en 1760: il n’y a pas de sources antérieures. Tallis musste sich als einer der ersten Komponisten der Herausforderung stellen, liturgische Musik in englischer Sprache zu schreiben. Es ist nicht klar, ob Tallis von einer bestimmten Person oder Institution damit beauftragt worden war, seinen Short Service zu komponieren (auch sein „First“ oder „Dorian“ Service genannt; hier handelt es sich um einen Gottesdienst mit Chorgesang, wobei die musikalische Komposition bestimmter Liturgie-Bestandteile, ebenso wie der eigentliche Gottesdienst, als „service“ bezeichnet wird; Anm. d. Ü. ), sobald jedoch das erste Prayer Book (1549) von Erzbischof Cranmer erlassen wurde, waren die Würfel gefallen. Gottesdienste wurden von nun an in englischer Sprache abgehalten und es gab eindeutige Verfügungen bezüglich der Musik, die dabei einzusetzen war (ein Ton pro Silbe)—Tallis hält sich an diese Vorgabe; es kommen keine Melismen und nur kaum Textwiederholungen vor. Es scheint zudem eine Anordnung gegeben zu haben, dass die hohe Treble-Stimme—ein wichtiges Charakteristikum der vorangegangenen Generation, welches auch in Tallis’ früheren Werken, darunter Ave, Dei patris filia, deutlich hörbar war—nun nicht mehr erforderlich oder angemessen war. Tallis’ Vertonung hat einen sehr begrenzten Tonumfang (es kommen lediglich zweieinhalb Oktaven zum Einsatz) und ist für nur vier Stimmen angelegt—eine tiefe Treble- oder Alt-Stimme, Tenor, Bariton und Bass. Der gesamte „Dorian Service“ findet sich in John Barnards First Booke of Selected Church Musick von 1641 und wurde in Boyces Cathedral Music von 1760 nachgedruckt; frühere Quellen sind nicht überliefert. Lord, have mercy upon us and incline our hearts to keep this law. Lord, have mercy upon us and write thou these thy laws in our hearts, we beseech thee. The Communion settings from Tallis’ Short Service (also called his ‘Dorian’ or ‘First’ Service) are a good example of the sort of music that Edward VI expected from his composers. They are rigorously syllabic and homophonic and must have been quite a shock to those used to the expansive and lengthy settings written by Robert Fayrfax, Nicholas Ludford and John Taverner. They are scored for four voices, with the two sides of the choir in dialogue, and display a cool restraint throughout with an austere beauty. The movements are presented in the order required by the 1552 Book of Common Prayer with the Gloria at the end of the service. It is clear that Tallis is writing more for the 1552 model than the 1549 version as he includes the Responses to the Commandments and omits the Benedictus. Les Communions tirées du Short Service (aussi appelé Office «dorien» ou «Premier» Office) constituent un bon exemple du genre de musique qu’Édouard VI attendait de ses compositeurs. Elles sont rigoureusement syllabiques et homophoniques et ont dû vraiment surprendre ceux qui étaient habitués aux musiques grandioses et assez longues écrites par Robert Fayrfax, Nicholas Ludford et John Taverner. Elles sont écrites pour quatre voix, avec les deux côtés du chœur en dialogue, et font preuve d’une froide retenue avec une beauté austère. Les mouvements sont présentés dans l’ordre requis par le Book of Common Prayer de 1552, avec le Gloria à la fin de l’office. Il est clair que Tallis écrit davantage pour la version de 1552 que pour celle de 1549 car il inclut les Répons aux Commandements et omet le Benedictus. Die Communio-Vertonungen des Short Service (auch als „Dorian“ oder „First Service“ bekannt) sind ein gutes Beispiel der Art von Musik, die Eduard VI. von seinen Komponisten erwartete. Sie sind streng syllabisch und homophon gehalten und müssen auf diejenigen, die an die großangelegten und langen Messvertonungen von Robert Fayrfax, Nicholas Ludford oder John Taverner gewöhnt waren, äußerst überraschend, wenn nicht sogar schockierend gewirkt haben. Sie sind für vier Stimmen angelegt, wobei die beiden Chorseiten wiederum im Dialog zueinander stehen, und legen eine kühle Zurückhaltung und enthaltsame Schönheit an den Tag. Die Sätze erscheinen in der Reihenfolge, wie sie vom Book of Common Prayer von 1552 vorgeschrieben ist, wobei das Gloria am Ende des Gottesdiensts steht. Es wird deutlich, dass Tallis sich mehr an die Vorgaben von 1552 als die von 1549 hält, da hier die Responsorien zu den Geboten mit einbezogen sind, das Benedictus jedoch ausgelassen ist. thy God: thou shalt have none other gods but me. of them that love me and keep my commandments. 4. Remember that thou keep holy the sabbath day. the Lord blessed the seventh day, and hallowed it. may be long in the land which the Lord thy God giveth thee. 10. Thou shalt not covet thy neighbour’s house. any thing that is his. ton Dieu : tu n’auras point d’autres dieux que moi. de ceux qui m’aiment et qui gardent mes commandements. celui qui aura dit son nom en vain. 4. Tu te souviendras du jour de repos pour le sanctifier. l’Éternel a fait du septième jour un mémorial, et l’a sanctifié. soient prolongés sur la terre que l’Éternel, ton Dieu te donne. 6. Tu ne tueras point. 7. Tu ne commettras point d’adultère. 8. Tu ne voleras point. 9. Tu ne porteras point de faux témoignage contre ton prochain. 10. Tu ne convoiteras point la maison de ton prochain. aucune chose qui soit à ton prochain. dein Gott: du sollst keine anderen Götter haben neben mir. dir, dass wir dieses Gebot einhalten. vielen Tausenden, die mich lieben und meine Gebote halten. 4. Gedenke des Sabbattages, dass du ihn heiligest. zu dir, dass wir dieses Gebot einhalten. lange lebest in dem Lande, das dir der Herr, dein Gott, gegeben hat. 10. Du sollst nicht begehren deines Nächsten Haus. R. Herr, erbarme dich unser. and was incarnate by the Holy Ghost of the Virgin Mary, and was made man: and was crucified also for us under Pontius Pilate. And he shall come again with glory, to judge both the quick and the dead; whose kingdom shall have no end. who with the Father and the Son together is worshipped and glorified; who spake by the prophets. the dead, and the life of the world to come. Amen. de même nature que le Père, et par lui tout a été fait. à la droite du Père. des morts, et la vie du monde à venir. Amen. Erde, die sichtbare und unsichtbare Welt. eines Wesens mit dem Vater; durch ihn ist alles geschaffen. Saint, Saint, Saint Seigneur Dieu des hôtes. Heilig, heilig, heilig ist Gott, der Herr Zebaoth. O Lord God, lamb of God, Son of the Father, that takest away the sins of the world, have mercy upon us. thou only, O Christ, with the Holy Ghost, art most high in the glory of God the Father. Amen. heavenly King, God the Father almighty. the sins of the world, have mercy upon us. the Father, have mercy upon us. roi des cieux, Dieu le Père tout puissant. les péchés du monde, aie pitié de nous. le Père, aie pitié de nous. die Sünden der Welt, erbarme ich unser. dem Vater sitzt, erbarme dich unser. He rememb’ring his mercy hath holpen his servant Israel; as he promised to our forefathers, Abraham and his seed for ever. scattered the proud in the imagination of their hearts. hath exalted the humble and meek. rich he hath sent empty away. and his seed for ever. se réjouit en Dieu mon Sauveur. Car il a daigné regarder: l’humilité de sa servante. en fuite dans l’imagination de son coeur. il a exalté l’humble et le faible. riche, il l’a renvoyé les mains vides. et à ses descendants à tout jamais. et is sera à tout jamais : dans le siècles des siècles. freut sich Gottes, meines Heilandes. Geschlecht bei denen, die ihn fürchten. hoffärtig sind in ihres Herzens Sinn. Vätern, Abraham und seinen Kindern in Ewigkeit. conformément à ce que tu as dit. que tu as préparé à la face de tous les peuples. être la gloire de ton peuple Israël. For he is the Lord our God: and we are the people of his pasture, and the sheep of his hands. Unto whom I swore in my wrath: that they should not enter into my rest. rejoice in the strength of our salvation. earth; and the strength of the hills is his also. before the Lord our maker. of his pasture, and the sheep of his hand. not enter into my rest. de réjouissance au rocher de notre salut. et montrons lui notre jubilation, en chantant des psaumes. sont en sa main ; et les sommets des montagnes sont à lui. faite ; et ses mains ont formé les terres sèches. mettons-nous à genoux devant l’Éternel, notre créateur. le peuple de sa pâture, et les brebis de sa conduite. qu’ils n’entrent pas dans mon repos. jauchzen dem Hort unsres Heils! die Tiefen der Erde, und die Höhen der Berge sind auch sein. seine Hände haben das Trockene bereitet. niederfallen vor dem Herrn, der uns gemacht hat. Weide und Schafe seiner Hand. nicht zu meiner Ruhe kommen. We praise thee, O God: we knowledge thee to be the Lord. The Holy Ghost also being: the Comforter. Thou art the everlasting: Son of the Father. When thou took’st upon thee to deliver Man: thou didst not abhor the Virgin’s womb. O Lord, save thy people: and bless thy heritage. We praise thee, O God: we ‘knowledge thee to be the Lord. and all the powers therein. earth are full of the majesty of thy glory. the Holy Ghost, also being the comforter. didst not abhor the Virgin’s womb. thou hast redeemed with thy precious blood. et toutes les puissances des cieux. la terre sont remplis par la munificence de ta gloire. La glorieuse compagnie des apôtres te loue. La sainte fraternité des prophètes te loue. La noble armée des martyrs te loue. le Saint Esprit, qui est aussi celui qui réconforte. Tu es le roi de la gloire, O Christ. tu n’as pas détesté les entrailles de la Vierge. ouvert le royaume des cieux à tous les croyants. Tu es assis à la droite de Dieu : dans la gloire du Père. Nous croyons que tu vas venir pour nous juger. rachetés grâce à ton sang précieux. Permets-leur de rejoindre les rangs de tes saints, dans la gloire éternelle. O Dieu, sauve ton peuple : et bénis ton héritage. Gouverne-les : et élève-les à tout jamais. ton nom : dans les siècles des siècles. Veille, O Seigneur, à nous garder aujourd’hui sans pécher. O Seigneur, aie pitié de nous, aie pitié de nous. O Dieu, laisse ta miséricorde s’étendre sur nous : comme notre confiance en toi. O Seigneur, en toi j’ai mis ma foi : ne permets pas que je sois jamais confondu. Herr Gott dich loben wir, denn du bist der Herr. Alle Welt betet dich an, Vater in Ewigkeit. heilig, heilig, heilig ist unser Gott, der Herr Zebaoth. Deine göttliche Macht erstreckt sich über Himmel und Erden. Die heiligen zwölf Apostel loben dich. Und die lieben Propheten loben dich. Die teuren Märtyrer loben dich. dich, Gott Vater im höchsten Thron. den Heiligen Geist und Tröster. Du bist der König der Ehren, o Christe. Du bist der ewige Sohn des Vaters. du hast den Leib der Jungfrau nicht verschmäht. allen Christen die Tore des Himmels geöffnet. Du sitzt zur rechten Hand Gottes, in Ehren des Vaters. Du wirst kommen, uns zu richten. durch dein teures Blut erlöst hast. Laß uns im Himmel mit den Heiligen teilhaben am ewigen Heil. Herr, hilf deinem Volk und segne, was dein Erbe ist. Führe sie und hebe sie hoch in Ewigkeit. Behüte uns heute, O Herr, vor aller Sünde. O Herr, sei uns gnädig, sei uns gnädig. O Herr, zeige uns deine Barmherzigkeit, wir hoffen auf dich. O Herr, ich hoffe auf dich, laß mich nicht verderben. To give light to them that sit in darkness, and in the shadow of death: and to guide their feet into the way of peace. house of his servant David. from the hands of all that hate us. shadow of death, and to guide their feet into the way of peace. des mains de ceux qui nous haïssent. Dans la sainteté et la droiture devant lui tous les jours de notre vie. et dans l’ombre de la mort, et pour guider nos pieds sur le chemin de la paix. dans l’éternité : monde sans fin. Amen. unsere Füße auf den Weg des Friedens. immerdar, und von Ewigkeit zu Ewigkeit. Amen.